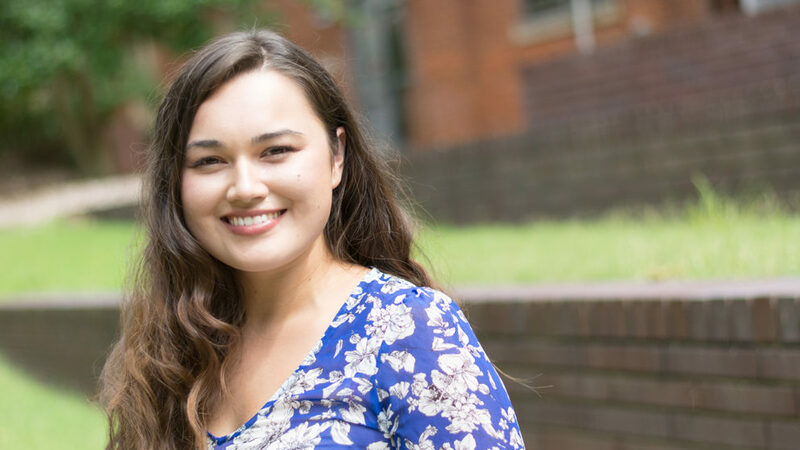 Madeline Yun ‘T19 focuses on courage for 2019 and gives her favorite tips for student-parents at NC State. It feels good to be back to school after winter break, doesn’t it? It has always been easier for me to navigate the spring semester after surviving fall semester. Combined with the general excitement of ringing in a new year, one year closer to graduation I might add, and I can hear the wide open possibility of 2019 calling my name! Now before I shout ‘carpe diem’ and dust off Walt Whitman poems, it is worth noting the most important issues of our time are being decided. Does anyone else feel discouraged when they read the news? I certainly do, but my go-to remedy is to remember I am a part of a community that does so much good in this world. I am constantly inspired by my fellow Goodnight Scholars, and I am excited to see what 2019 holds for all of us. I think being courageous is an easily ignored virtue. We aren’t explicitly taught to have courage. It is hard to be courageous because the alternative is usually easier and more comfortable. Personally, I struggle with having the courage to try something completely new and the fear of failing. I have to constantly push myself. Especially being a parent, it is hard to justify applying for that Study Abroad Program, giving up time with my family to build RapidCat, or even to celebrate with friends after finals. I look around and I don’t see a whole lot of other students like me. There is no mold for me to follow, but when I dig deeper, I find strength in being the first of my kind. My strength is my ability to chart my own path, but this requires courage. The courage to allow myself to take chances, make mistakes, and get messy (thanks, Ms. Frizzle! ), and the courage to stand up for what I believe in. The amazing part about being a woman is not just our capacity for courage, but our drive to lift up the next generation, team, cohort, and you-name-it. With that spirit in mind, I would like to share some of my top tips for being a student-parent at NC State. Adapt these tips for your own family, and if you don’t have any children, you may still find them useful! I am running the risk of sounding like a complete lunatic, but hear me out. Grumpy preschoolers and early morning classes don’t always mix. Sometimes my mornings are smooth sailing, and some days my mornings are hurricanes, but they are always a sprint. It is easy to feel worn out before I even make it to class, but I have found that taking the time to get out anxiety and frustration really helps. If you are worried about other drivers looking at you like a crazy person, just give them a smile and a wink. Depending on your financial situation, this could help you pay for some of the expenses you are responsible for outside of typical college costs like tuition, rent, and food. This includes adjusting your calculated cost of attendance to include childcare for dependents. Contact your financial aid counselor, and they will let you know the required documents to provide. I have found that professors at NC State love getting to know their students. They often have children of their own, and are remarkably understanding when it comes to the difficulties of being a student-parent. Don’t be afraid to reach out! I have never brought my daughter to class with me, but she has been on campus many times. Children love being involved in your university life, and it makes them so proud. It also inspires them from a young age to go to college. Your education really is a journey for your whole family! Take the Wolfline to Talley Student Union, get some Howling Cow Ice Cream, and find a place to enjoy it. Also, the grass in the Oval on Centennial Campus is perfect for flying a kite. One of the benefits of being a full-time student-parent is that my schedule is a little more flexible on the weekend. I try to take advantage of that by going on outdoor adventures with my daughter. There are tons of trails around NC State, Pullen Park, and the Farmer’s Market. 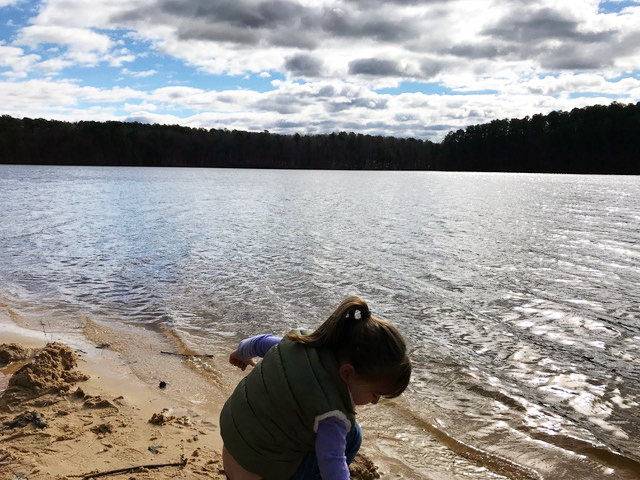 It is so relaxing to explore nature with your child and spend quality time together. I am guilty of not always taking care of my emotional health. I find I have a shorter temper and smile less when I am feeling burnt out. During transfer orientation, I remember a speaker telling us to take advantage of the Counseling Services at NC State because it may be the last time we have access to free therapy. This list of tips could stretch on and on, but the last piece of advice I would like to impart is to simply give yourself some grace. Remember you are already doing your best for your family by going to college, improving your potential lifetime earnings, and by being a strong role model. Have courage because being a student-parent is not the easiest path, but it is unbelievably rewarding.